GGotW: When did you start modeling? GGotW: What got you started modeling? Eleine: I was just taking some pictures to make a portfolio as a singer, and several photographers mentioned that I should model more, I was very easy to photograph they said. So I made contact with a model agency and was accepted – but almost all the connection I’ve made with the brands I’ve worked with I’ve made myself, or thanks to the founder of Gothic and Amazing, Sil Costa, she’s been an angel and supportive since the very start. GGotW: Where are you based? Eleine: In the south of Sweden. GGotW: Do you ever model outside of sweden? Eleine: I would, but thus far I’ve been able to do everything in Sweden, at our very own studio. So when working for brands outside Sweden they send over the items to our studio. GGotW: Who have you modeled for? Eleine: To mention a few; Odium Clothing, Sinister, Hysteria Machine, Forge Fashion Nocturne Jewellry, Elegant Curiosities, Fairytas, Lena Quist, Sinners & Saviours, made the cover of Scandinavian Tattoo Magazine earlier this year, and many other brands that I’m very proud of been working with. GGotW: Speaking of Tattoos, is there a story behind the large clock? Eleine: Yes and no. I’ve always loved that type of clock. It’s very beautiful. My grandma owned one that she left me after she passed away and it means a lot to me. One day my tattoo artist showed me an idea she had, and when I saw that it was almost the exact same clock she had sketched, I immediately fell for it. GGotW: When did you start your band? Eleine: The whole idea of Eleine started about 2011/2012, but we were a complete band late 2013. GGotW: How did you meet the members of your band? Eleine: Rikard, our guitarist, and I met in 2012. Then we got in touch with Andreas, David and Sebastian through and old friend of mine, and we felt the last pieces took place in the puzzle. GGotW: How would you describe your music? including the music. 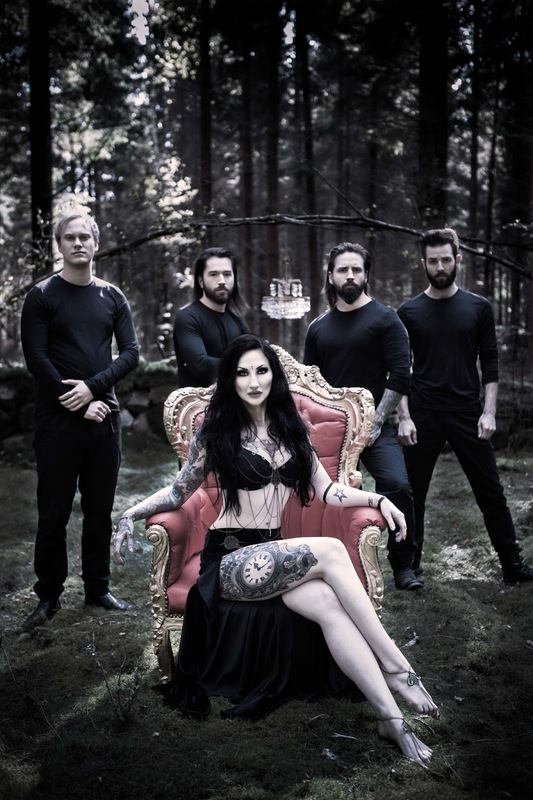 Beautiful symphonic metal with dark intent. GGotW: How many Albums have you released? Eleine: One! Our first album “ELEINE” was released April 18th. Before that we released two singles, “Gathering Storm” and “Land Beyond Sanity”. GGotW: Who does the writing for the band? Eleine: For our first album Rikard and I with a producer from Cardiac Records wrote the music together. Now, Rikard and I do the main part of writing. Never excluding anybody, all good ideas are welcome. GGotW: Any plans for the band to tour? Eleine: We’re working on the tour plan right now. GGotW: Rikard seems to be a talented photographer, did you meet him as a photographer first or a guitarist? Eleine: Yes he his! But we met because of the music at first. The photography skills showed up later on and I’m very happy about that! He snaps the shots and I edit the photos. We make a good team! Click on the images that appear with the article to see larger versions. Please feel free to leave comments below, you don’t need to be a member to leave comments.